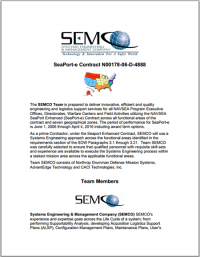 The SEMCO Team is prepared to deliver innovative, efficient and quality engineering and logistics support services for all NAVSEA Program Executive Offices, Directorates, Warfare Centers and Field Activities utilizing the NAVSEA SeaPort Enhanced (SeaPort-e) Contract across all functional areas of the contract and seven geographical zones. The period of performance for SeaPort-e is November 19, 2013 through December 31, 2019 including award term options. As a prime Contractor, under the Seaport Enhanced Contract, SEMCO will use a Systems Engineering approach across the functional areas identified in the requirements section of the SOW Paragraphs 3.1 through 3.22. Team SEMCO was carefully selected to ensure that qualified personnel with requisite skill sets and experience are available to execute the Systems Engineering process within a tasked mission area across the applicable functional areas. Team SEMCO consists of Northrop Grumman Defense Mission Systems, AdvantEdge Technology and CACI Technologies, Inc.